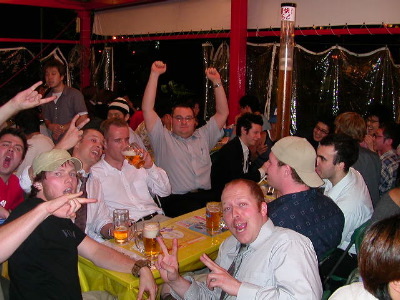 One of the primary afterwork activities in Japan is drinking. At the Sapporo beer festival, this involves towers of beer. We eventually had three on our table. This was our second beer garden of the night. Next we went to watch a soccer game at a bar. I forget who most of the people are. Blair is at the front giving the double peace sign, very Japanese . Phil is at the back, with two fists in the air. Most of them were Nova teachers or ex-Nova teachers.